There are certain things that are understood without having to be said, because they're very obvious. Things like "never get involved in a land war in Asia" or "never go against a Sicilian when death is on the line" are examples of these kinds of things. Other examples can be found in the kinds of things that Captain Obvious might say, such as "the sky is blue" or "Philadelphians sure drink a lot of alcohol". But what drives Philadelphians to drink so much alcohol? The short answer is that outside of prohibition, Philadelphians have always consumed large quantities of alcohol. And as many Philadelphians might point out, prohibition wasn't much of an obstacle for the city's dedicated alcohol consumers. When it comes to alcohol consumption then, the city of Philadelphia is starting out with a strong base. So what might prompt already heavy-drinking Philadelphians to boost their alcohol consumption to even higher levels? Believe it or not, the city's controversial tax on soft drinks would appear to be behind the city's recent surge in alcohol sales. 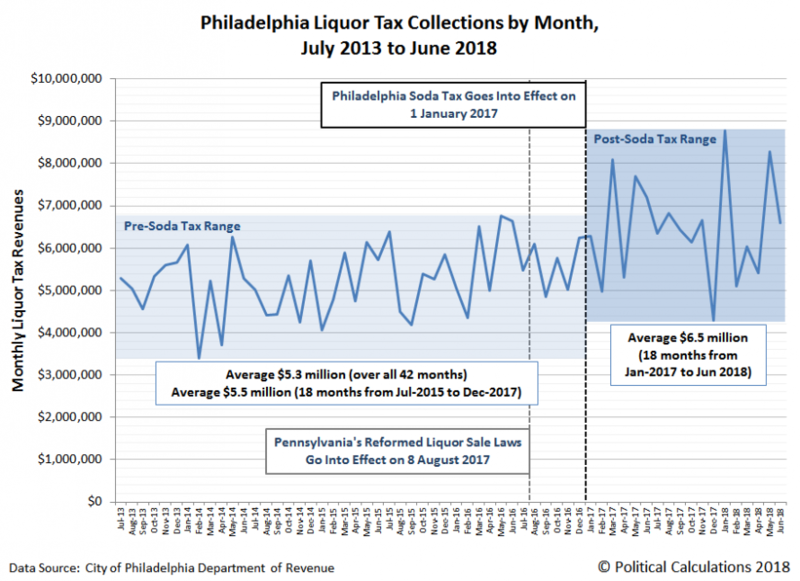 Last August, Scott Drenkard and Courtney Shupert of the nonpartisan Tax Foundation found that Philadelphia's "high tax rate on nonalcoholic beverages makes them more expensive than beer in some cases", which they believed was "likely to drive consumers to more alcoholic beverage consumption". Philadelphia's monthly liquor tax collections confirm that this outcome has come to pass, where the revenues from the city's 10% tax on alcoholic beverage sales is documented within its tax reports for School District revenue collections. The following chart, which covers the City of Philadelphia's last five fiscal years, reveals that in the 18 months since the implementation of the city's controversial tax on all naturally and artificially-sweetened beverages distributed for retail sale within the city went into effect, the city's is collecting an average of $6.5 million more per month from its alcohol taxes, up from the average of $5.5 million per month it collected in the 18 months preceding the soda tax implementation, an increase of $1 million per month on average. 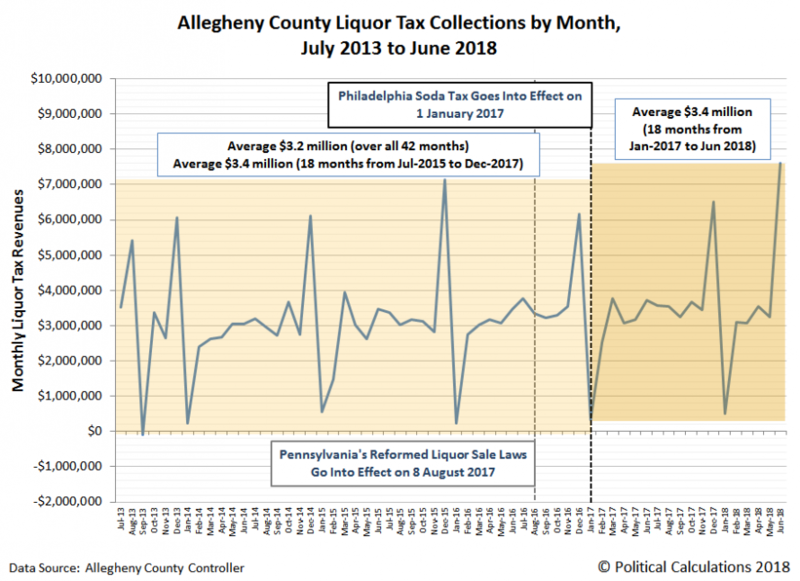 The same phenomenon is not evident on the opposite side of Pennsylvania, where Allegheny County's revenues from its 7% tax on alcoholic beverage sales indicate no meaningful difference in the level of alcohol sales in that region of the same state over the same period of time (the data for June 2018 is preliminary). The two observations together are important because Allegheny County, being in the same state as Philadelphia and thereby subject to all of the same state laws and regulations on the sale of alcohol, represents the control in what amounts to a natural experiment for measuring the effect of Philadelphia's soda tax upon liquor sales. And what a difference it appears to be. Doing the math to work out the corresponding level of liquor sales, Philadelphia's residents would appear to have increased their average monthly consumption of alcoholic beverages from an average of $55 million to $65 million, an increase of $10 million in the sales of taxed alcoholic beverages per month. Let's put that figure into a more fun context! In January 2017, just after Philadelphia's soda tax went into effect, the Tax Foundation documented that the sale price of a 12-pack of Icehouse beer, which had just become cheaper than a 12-pack of non-alcoholic Propel sports drinks, was $7.99 in Philadelphia. 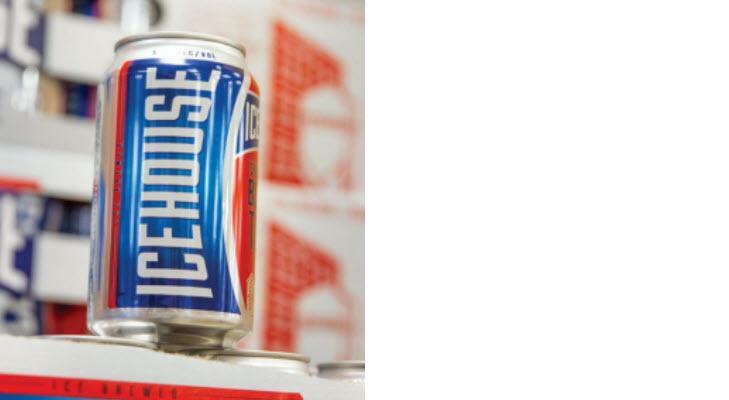 For the sake of argument, let's say that after Philadelphia's soda tax went into effect, Philadelphia's residents began exclusively consumed $10 million worth of Icehouse beer per month at this price. How many extra bottles of beer per month is that? Dividing the average increase of $10 million per month by $7.99 for the 12-pack of Icehouse beer, we find that corresponds to the equivalent of roughly 1.25 million 12-packs per month, which works out to be about 15 million extra 12-oz bottles of beer consumed in the city. Per month. Philadelphia's total population in July 2017 was estimated to be 1.581 million people. So, after the City of Philadelphia imposed its sweetened beverage tax in January 2017, every man, woman and child living in the city responded by increasing their consumption of Icehouse beer by 9.5 bottles per month. Multiplied by 12 months, that's an increase of 114 bottles per year. Of course, that's a ridiculous number, because Pennsylvania prohibits the sale of alcoholic beverages to individuals under the age of 21. That prohibition blocks some 26% of the city's population from even being able to buy Icehouse beer, assuming that the law is actively enforced against Philadelphia residents under that age. If we do the back-of-the-envelope math to estimate how many extra equivalent 12-fluid-ounce bottles of Icehouse beer that Philadelphia's adult population is consuming, we come up with a monthly increase of 12.9 bottles per legal drinking-age Philadelphian, or over 154 bottles of Icehouse beer per adult in the city per year. If we convert 12-fluid-ounce bottles of Icehouse beer into the equivalent number of calories, we find that at 149 calories per 12-fluid ounce container, Philadelphia's adults are drinking in an additional 1,916 calories per month, or just over 22,989 calories per year. Since a 12-ounce bottle of Coca-Cola has 140 calories, that's a nearly one-for-one swap where calories are concerned, so there's no realized health benefit from calorie reduction for the portion of Philadelphia's adult population who have changed out sugary soft drinks for beer. For consumers who switched from low-to-no calorie soft drinks to beer, their calorie consumption would have substantially increased. That of course doesn't consider the impact of other potential health and safety issues that city health officials believe would go along with the increased alcohol consumption in Philadelphia that have come about as a direct consequence of the city's controversial soda tax. No matter what, one solid fact holds true. Philadelphians sure drink a lot of alcohol, and since the city's soda tax went into effect, they are sure drinking a lot more!